Few things instill fear in the hearts of people like seeing a snake. Snakes get a bad rap for being slimy, gross, and mean. In reality, snakes are never slimy or gross, and most will leave you alone if you provide them the same courtesy. A variety of snakes live in the grasslands, hills and forests of southeast Colorado. One of the most common snakes in southeast Colorado is the blackneck garter snake (Thamnophis cyrtopsis). The blackneck is mostly olive green, with a yellow stripe down the middle of his body and a light gray belly. This snake is one of the few remaining garters in Colorado. He's active in grasslands and survives on small fish, amphibians, and other snakes. The blackneck is harmless to people and generally shies away from them. Southeast Colorado. also has the Western terrestrial garter snake (Thamnophis elegans), which is. brown or gray. The Western terrestrial lives in areas with moist vegetation and feeds on worms, toads, fish and rodents. Someone who's unfamiliar with snakes might mistake the blind snake (Leptotyphlops dulcis) for an earthworm. This is pinkish brown and only 8 inches long. He even mimics a worm’s habitat, making his home in the loose soil and often coming up only after a rain. The blind snake feeds on the larvae of termites and ants. If threatened, he might try to poke at his perceived enemy with his tail, but it will not hurt. This species is harmless to humans. Not all snakes in Colorado’s southeast are harmless. 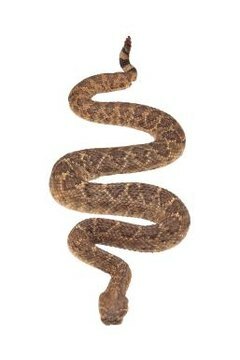 The Massasauga rattlesnake (Sistrurus catenatus) ranges from 18 to 30 inches long. The Massasauga’s body is gray or tan, with lines of small and large black spots down his back. He thrives in the brush and grasslands, surviving on small mammals, lizards, other snakes, and centipedes. The Massasauga is a protected species. He avoids human contact, but will bite if he feels threatened. He is a venomous species. Much larger is the prairie pattlesnake (Crotalus viridis), which grows to about 56 inches. His behavior is much different than a Massasauga’s, and he's not as shy. The prairie rattlesnake is dark gray with brown spots, and he has a large rattler. He prefers to spend his time in the open grasslands that have many mammal burrows. He eats lizards, rodents and gophers. The prairie rattlesnake lives at elevations of up to 9,500 feet. He bites if he feels threatened, and he is venomous. Several other species are common throughout southeast Colorado, mostly in grasslands. The coachwhip (Masticophis flagellum) is a smooth, yellow snake that grows to be roughly 70 inches. The common kingsnake (Lampropeltis getula holbrooki) is smooth with a yellow underside, black head and speckled body. Also common species is the glossy snake (Arizona elegans), a harmless constrictor with dark gray or brown speckles outlined in black. The Great Plains rat snake (Pantherophis emoryi) is a gray constrictor with dark spots. The beautifully colored ground snake (Sonora semiannulata) ranges from gray to reddish-brown; some have black stripes. The harmless night snake (Hypsiglena torquata janii) has smooth, gray scales, sometimes with a bit of yellow. The ringneck snake (Diadophis punctatus) has a range of colors, including gray, olive green, blue, and orange. It combines constriction and venom to kill its prey.